Despite false rallies in the currency market, I have stressed that there is no reason for the liquidation to be over. 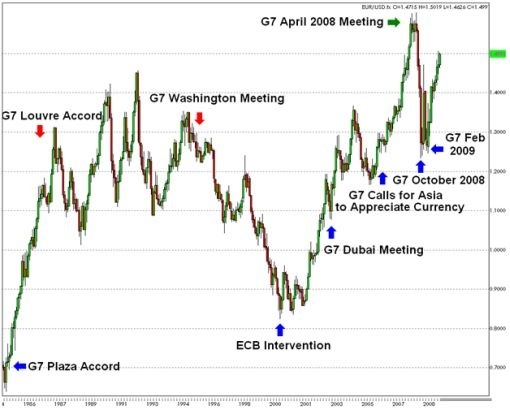 I warned that the currency and stock market rallies were a mirage rather than a bottom and now, the pessimistic tone of the FOMC minutes has forced another wave of liquidation. Tuesday’s rebound in risk appetite was short-lived as the FOMC minutes revealed that the contraction in the US economy could last well into the summer of 2009. In light of the 400 point drop in the Dow, the US dollar and Japanese Yen regained strength as repatriation and risk aversion continues to drive demand for the low yielders. The greenback’s recent strength can be most clearly seen in USD/CHF, which hit a fresh 14 month high today. As we predicted, the FOMC minutes was the trigger for a major move in the currency market. However the moves that we have seen today need to be sustained before we can see a more meaningful breakout of the recent consolidation that we have seen across the currency market. Something more powerful such as a decision on bailing out the automakers, next week’s GDP report or another surprising abysmal loss in the corporate or financial sector may be needed before we see new trends develop. The tone in the FOMC minutes, like the tone of Bernanke’s testimony yesterday was unmistakably dovish. The members of the monetary policy committee lowered their growth and inflation forecasts, talked about the downside risks to growth and how the contraction in the US economy will not temper until the middle 2009, at the earliest. Some members of the committee even openly discussed the need for further rate cuts, which confirms that rates will be lowered again in December. The Fed feels frustrated that interest rates are closing in on zero and acknowledged that it leaves them with little room to maneuver. Fed fund futures are pricing in a 50bp rate cut with a minor chance of a 75bp cut to 0.25 percent. If the Fed cuts interest rates by 50bp and the US economy fails to recover, their credibility will go out the window as the market questions their ability to tap other tools to stimulate the economy. The Big 3 Automakers (General Motors, Ford and Chrysler) were on Capitol Hill today pleading for a bailout. Although a bailout of the automobile industry is inevitable in our opinion, it remains to be seen whether lawmakers will act quickly. The longer this drags out, the more pain it will cause for US equities.